Pharmaceutical Instruction Sheet - Flottman Company. Our customer needed to include instructions for use within their packaging for patients using their medication. Utilize miniature folding to create an instruction sheet insert that folds down into a small, manageable size. The 2.125″ by 2.75″ insert printed literature fits in easily with the medication in its packaging and includes detailed step-by-step instructions. Flottman Company’s miniature folded inserts are the ideal solution for including medication instructions in pharmaceutical packaging. They provide extensive copy space while not taking up much room in the packaging. 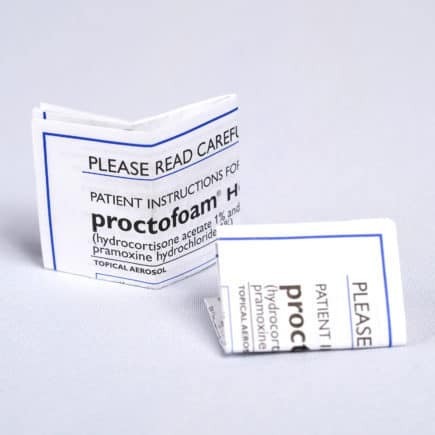 By using miniature folding for their pharmaceutical instruction sheet, this customer was able to include detailed instructions with large and easy-to-read text. The insert also includes diagrams for every step to ensure patients use the medication correctly. This medication is dispensed via an applicator, so the instructions are crucial in order for patients to administer the medication properly. Our miniature folding capabilities allowed the company to lay out the instructions on a standard 8.5″ by 11″ sheet of paper that folds down into a 2.125″ by 2.75″ insert. The folded size fits in well with the medication’s packaging, while the flat size is still small enough to be handled easily by the patient. The insert was printed and folded completely in house. Our ability to produce the entire job at our facility allows for a cost and time savings for the customer. Our inserts are produced completely in-house and delivered ready to insert into the product packaging. This is a two-color print job, with black ink and a Pantone ink, printed on both front and back. The Pantone color matches the medication’s branding, and also allows for color illustrations with the diagrams. A miniature folded product insert proved to be the perfect solution for this customer’s pharmaceutical instruction sheet. Can your company benefit from switching to miniature folded instruction sheets? Are you looking for a lower price for your already existing miniature folded pieces? Request a quote today and find out how Flottman Company can help you!